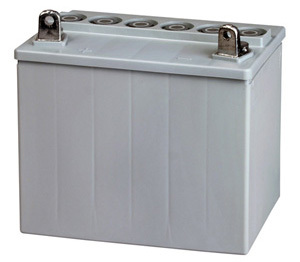 Gel 31.6 AH Battery (20 Hr Rate) is no longer available to purchase through our site. U1 size (8 5/16" x 5 1/8" x 7 1/4") Fits the WMR U1 Buddy DC-to-GO Box. Terminals: Motorcycle style bolt-on terminals. Over 6000 10% or 500 100% discharge cycles. Recommended for applications where the battery is typically fully charged, then fully used before recharging. This is a referred to as a deep-cycle application, similar to a boat trolling motor battery. The radio application would be for limited power portable QRP Applications where Limited Current Charging, or Solar Power Charging may be available.